One of the most influential recording artists of the late 20th century, Joni Mitchell has often reflected on social and environmental ideals through her music. 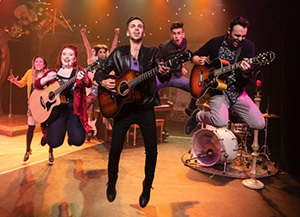 Circle Game reinterprets Mitchell’s iconic songs such as “Big Yellow Taxi,” “River,” “California,” and “A Case of You” through the ears and eyes of a new generation, connecting to the politics and world we know today. Winner of the 2017 Ovation Awards for Outstanding Professional Production and Outstanding Music Direction. More information here.